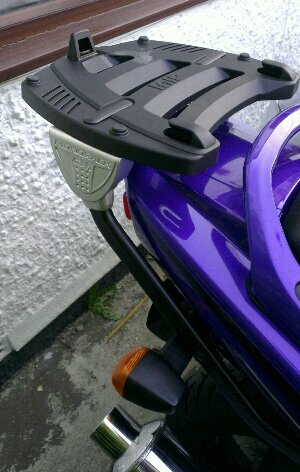 Managed to grab an hour at the weekend to replace the Givi rack on the Fazer. The arms on the old one were thoroughly bent from the last crash, which snapped the top box off. Tried as I could they wouldn’t bend back. To be honest I also doubted how strong they would be after if I did get them back into shape. The new went on a treat, dead easy. Interestingly this one came with black painted bolt, rather than plain aluminium. Can’t decide which I prefer, might go for a combo to blend in with black arms and aluminium pillion peg brackets.